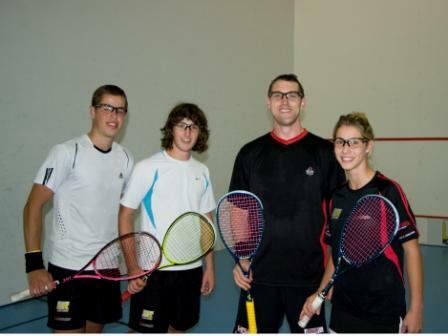 From the vault: The Squash Factory opens its doors! At 6.30pm on Wednesday 22 April 2009, approximately 200 people watched World Champion David Palmer cut the red ribbon to officially open The Squash Factory in Wangara. Sue Cowell, representing the owners of The Squash Factory, welcomed various dignitaries including WA Squash President Steve Bowen and Ambassador for WA Squash Sue Hillier. Also in attendance were WA Squash Life Members, Marmion Squash Club Life Members, WA Squash Board and Committee Members, Marmion Squash Club Committee Members, family and friends. As the crowd settled back into their seats, David Palmer took to the court to play singles against reigning Australian Junior Champion Zac Alexander (19). David mesmerised everyone with his skill as he put Zac through his paces. The crowd was in awe of the fantastic array of shots, the skill, perfection, and athleticism of Palmer, as well as the level of squash Zac produced as he rose to the occasion. 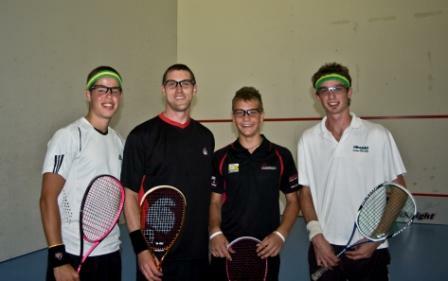 After their game, David paired up with 16-year-old Luke Bunting for a doubles match against Zac and his partner Tim Cowell (20). The excitement of fast-paced doubles on a proper-sized court left the crowd in awe, with The Squash Factory the only squash centre in Perth capable of hosting true doubles squash. David then teamed up with 14-year-old National Champion Emily Bunting, once again facing Zac Alexander, this time with Jake Davidson (16). Another great game, as well as a fantastic experience for some of Marmion's up-and-coming juniors. Towards the end of the evening David signed three framed rackets, one for a lucky raffle winner (Scott Jeffreys), one to WA Squash President Steve Bowen, and one to The Squash Factory - still on display behind the bar! Overall it was a fantastic night to officially open the centre. Management, the shareholders and the Marmion Squash Club would like to thank everyone who helped out and attended and hope the evening was enjoyed by all. ← Congratulations to our Winter 2013 Champions!